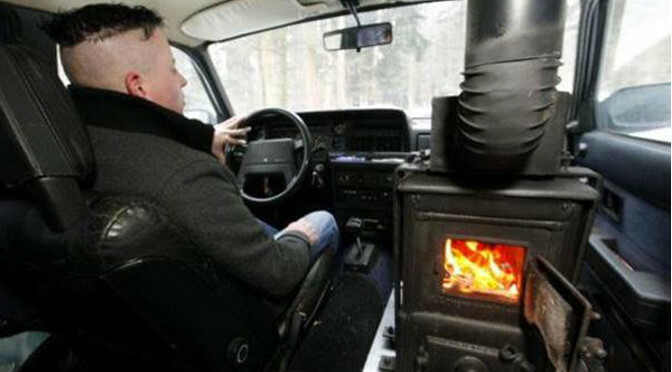 You too can learn to install the latest in portable wood heating technology! 1) Get just a little experience. 2) Pass a multiple choice test. 3) Buy an inexpensive bond. That’s it! 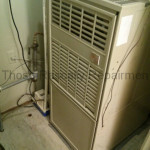 You’re now a bona fide, certified, gasified and maybe even ignified heating and air conditioning contractor. Your financial future is solidified! Customers got you antagonized? 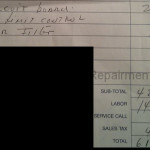 If you’re as careless as our featured contractor, they might inadvertently be nullified! While the state ostensibly requires those applying for a license to have four years of journeyman experience, many get licensed with just a few years of apprentice experience. How can that be? The state investigates just three percent of applications. It can be. Even if the application is investigated, journeyman experience is not the same thing as a journeyman program. An applicant need not go through any kind of program at all. If an employer says the applicant has worked as a journeyman for four years, that’s good enough. As you’ve read, the test is multiple-choice. There are dozens of license schools that teach the test. Applicants can take practice tests until they have the answers memorized. They need not worry about a practical test. There isn’t any. There isn’t even an interview. A bond is nothing but pathetic insurance. The bond company doesn’t do a background check. They don’t do anything except back the contractor’s work for a measly $12,500 for all claims ever. If one homeowner files a $20K claim first, that homeowner gets $12.5K. All subsequent claimants get nothing. While a freshly minted contractor had these few low hurdles to clear, his employees have none. A contractor can hire a thousand repairmen and they don’t have to be tested or certified in any way. Those repairmen, like the licensed contractor they work for, don’t even have to attend trade school. It seems that, as far as the state is concerned, school is out. Or at the very least, school is not “in”. Hindrance Heating, a licensed California contractor, reflects the state’s too cool for trade school mentality. 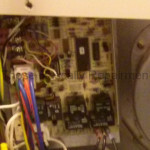 They worked on the furnace pictured below a year ago. The problem they ostensibly fixed returned, so I came out today. When I arrived the furnace ran normally for quite some time. I had to wait a while, but as you can see in this video the burners started short cycling. 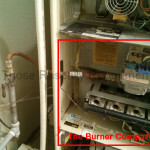 The short cycling caused the burner compartment (also pictured below) to overheat. The furnace had a fuse that’s supposed to to prevent that, but it was gone. 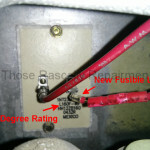 The furnace also has a sensor that’s supposed to be rated for 160 degrees. 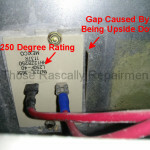 The one that was in there was rated for 250 degrees and was installed upside-down. 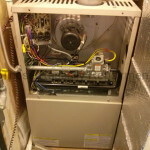 Next to the furnace was Hindrance Heating’s invoice from a year ago. 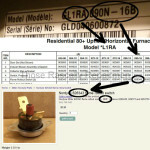 It states that they replaced the internal sensor, the circuit board and the air filter. I don’t know all the details. However, I have a pretty good idea of what might have happened a year ago. 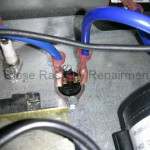 When Hindrance arrived they found the blown fuse. They didn’t have a new fuse with them, so they bypassed it. 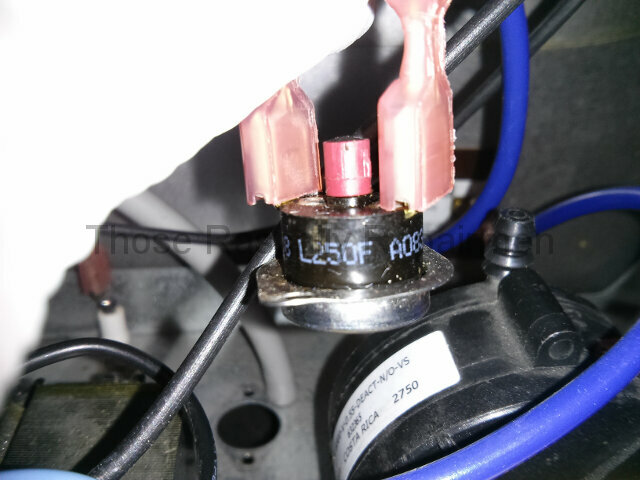 While bypassing the fuse they broke the sensor. 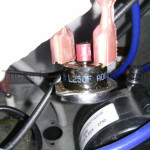 That was easy to do because the fuse is attached to the sensor and the sensor gets brittle with age. 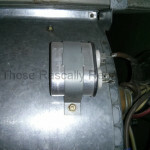 They didn’t have a new sensor rated the same, but they did have one rated ninety degrees higher – so they installed that. 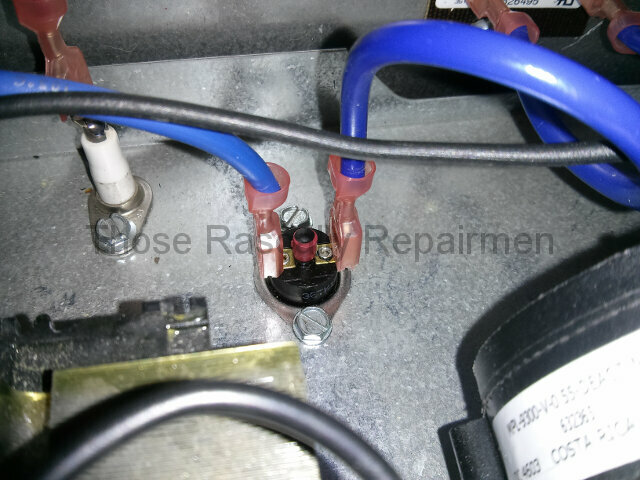 They wouldn’t have been able to charge much for bypassing a fuse, so they “diagnosed” a bad circuit board and replaced that too. With the furnace running, they took off. 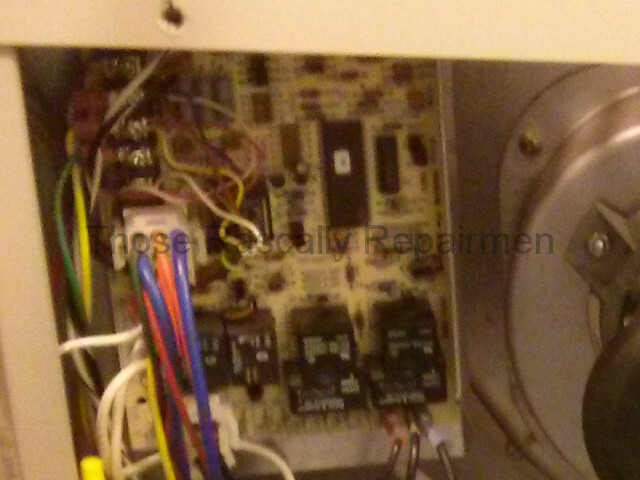 In other words, they “fixed” the furnace by bypassing a safety device without ever knowing why the safety failed. Admittedly, the above is a mixture of fact and conjecture. However, the known facts are completely inexcusable: They bypassed one safety and altered another. That’s just plain nuts. 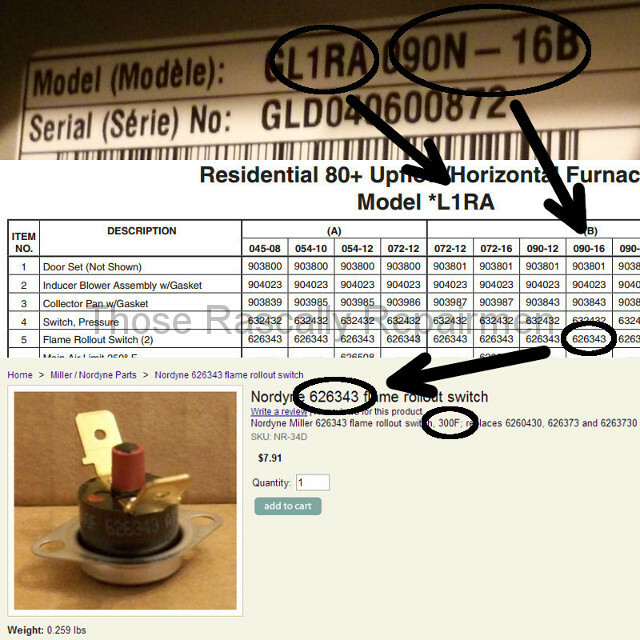 And charging $610 for an hour’s work and parts that cost $75 wholesale? I’ll let you decide if that’s just plain greedy. The short cycling they never saw was the symptom that led to the real diagnosis: a clogged vacuum port. 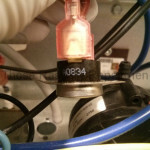 I cleared the port, replaced the missing fuse, installed the correct sensor and replaced a weak capacitor for $340. The intermittent nature of the symptoms meant that the diagnoses took four or five times longer than normal, but that didn’t matter. What mattered was making the correct diagnosis. That’s quite the difference, no? Yet in the state’s eyes Hindrance Heating and I are the same. We’re both licensed and bonded C-20 contractors in good standing. Hindrance Heating isn't done hindering. Click here for more. A couple of months after my first taste of “Hindrance aftermath”, I was called to repair another furnace that HH had attempted to fix. 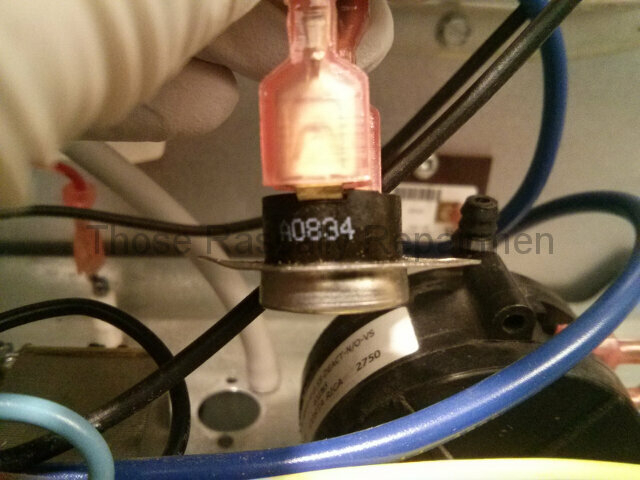 This flame rollout switch was tripping repeatedly. When that happens, it’s almost never because the switch itself is defective. Yet that was their diagnosis, so they replaced it. Predictably, the problem returned. It is virtually impossible for a circuit board to fail in such a way as to cause that switch to trip, but a failed circuit board was their next attempt at a diagnosis. So they replaced the circuit board. Predictably, the problem returned again. That’s when the homeowner called me. After some initial testing I removed the switch to look at it. As you can see, it’s rated for 250 degrees. It’s supposed to be rated for 300 degrees. In other words, the switch was tripping because it was the wrong one. HH didn’t need to find the chart pictured below to figure that out. They just had to call factory tech support. Tech support is free to all contractors. 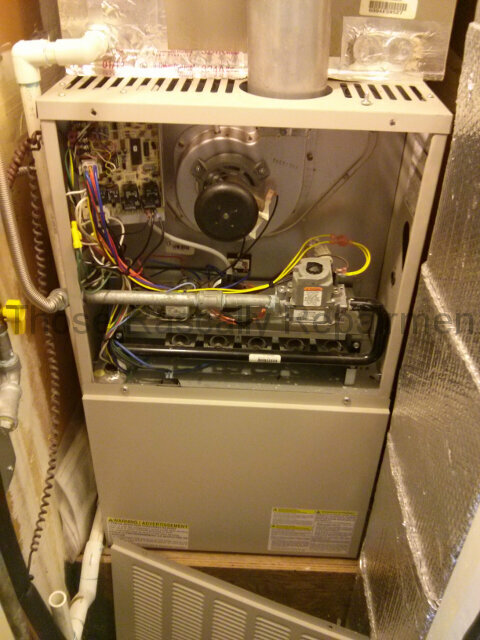 The furnace is a 2004 model. The incorrect switch was made in 2008. HH said that they put the old switch back. If that’s true then it’s not HH’s fault that the incorrect switch was installed. However, it is their fault for wasting hundreds of the homeowner’s dollars on an expensive goose chase. And it is the state’s fault for doing almost nothing to prevent the utterly unskilled and unschooled from getting a license.